When the liquid crystal is a solid, its molecules are lined up parallel to one another. In the intermediate cloudy phase (liquid), the molecules still retain this more or less parallel orientation. As in any liquid, the molecules are free to move around, but they tend to "line up" in one direction, reflecting light and causing a cloudy appearance. Higher temperatures tend to agitate the molecules and thus make the liquid clear. In an LCD, an electric current is used to switch segments of liquid crystals from a transparent phase to a cloudy phase, each segment forming part of a number or letter. The segments can also be in the shape of tiny dots or pixels, and the can be arranged in rows and columns. They are turned on and off individually to either block or allow polarized light to pass through. When the light is blocked, a dark spot is created on the reflecting screen. In all LCDs, the liquid crystal is sandwiched between 2 pieces of glass or transparent plastic called substrates. If glass is used, it is often coated with silicon dioxide to improve liquid crystal alignment. Transparent electrode patterns are then made by applying a layer of indium tin oxide to the glass and using a photolithography or silkscreening process to produce the pattern. also strengthens and protects the display glass and anchors the entire display to the device using the LCD, whether it is a laptop computer, a fax machine, or another device. Finally, the power supply is an electronic circuit that supplies current to the LCD. Equipment makers who use LCDs often purchase the power supplies separately. Making passive matrix LCDs is a multi-step process. The surface and rear glass of the display is first polished, washed, and coated with silicon dioxide (SiO 2 ). Next, a layer of indium tin oxide is evaporated onto the glass and etched into the desired pattern. 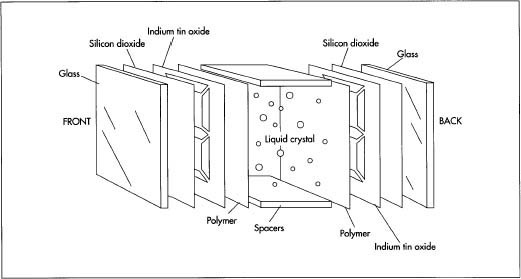 A layer of long chain polymer is then applied to allow the liquid crystals to align properly, followed by a sealing resin. The spacers next are put into place, and the glass sandwich is filled with the liquid crystal material. 1 First, the two glass substrates must be cut to the proper size, polished, and washed. Cutting can be done with a diamond saw or scribe, while polishing involves a process called lapping, in which the glass is held against a rotating wheel that has abrasive particles embedded in it. After being washed and dried, the substrates are coated with a layer of silicon dioxide. 6 If LCD makers want to align liquid crystals perpendicular to the glass surface, another technique is used: coating the glass with an amphophilic material. This is material whose molecules display affinity for water at one end of the molecule and repulsion from water at the other end. One end—the affinity end—adheres to the glass surface while the other end—the repulsing end—points into the liquid crystal area, repelling the liquid crystals and forming them into an alignment that is perpendicular to the glass surface. 7 A sealing resin is next applied to the substrates, followed by plastic spacers that will give the liquid crystal cell the proper thickness. Next, the liquid crystal material is injected into the appropriate area between the two glass substrates. The thickness of the LCD cell is usually restricted to 5-25 micrometers. Because proper thickness is crucial for cell operation and because spacers don't always achieve uniform thickness, LCD makers sometimes put appropriately sized glass fibers or beads in the liquid crystal material. The beads or fibers cannot be seen by the naked eye. They help hold the cell at the proper thickness while the sealant material is setting. 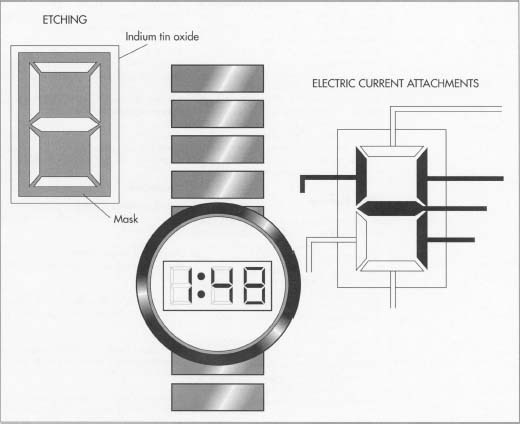 In a typical LCD watch assembly, the shaded areas are etched away chemically to form the electrode pattern. The segments are turned on and off individually to either block or allow polarized light to pass through. When electric current is applied to a segment, the light is blocked and a dark spot is created on the reflecting screen. The process used to make an active matrix LCD (AMLCD) is quite similar to that used for passive matrix LCDs, although it is more complex and more difficult. Generally, the steps of SiO 2 coating, indium tin oxide application, and the photoresist etching are replaced by a host of other steps. In the case of AMLCDs, each LCD component has to be changed to work properly with the thin film transistor and electronics used to boost and clarify the LCD image. Like their passive matrix brethren, active matrix displays are sandwiches consisting of several layers: a polarizing film; a sodium barrier film (SiO 2 ), a glass substrate incorporating a black matrix, and a second sodium barrier film; a color filter and a color filter overcoat made of acrylic/urethane; a transparent electrode; an orientation film made of polyamide; and the actual liquid crystal material incorporating plastic/glass spacers to maintain proper LCD cell thickness. LCDs—especially those for laptop computer displays—-are made under highly controlled conditions in a clean room environment to maximize yield. "Clean rooms" have special air filtering devices designed to keep all dust particles out of the room, and workers inside the room must wear special clothing. Nonetheless, many LCDs have to be discarded because of imperfections. This is particularly true of AMLCDs, which currently have a rejection rate of approximately 50 percent. To minimize the rejection rate, each active device is inspected and as many are repaired as possible. In addition, active matrix assemblies are inspected immediately after the photoresist etching step and again after the liquid crystal material is injected. But the real boost to LCD manufacturing technology may come from all the money that companies are pouring into the research and development process on large screen, AMLCD displays for the long-awaited high-definition television technology. Collins, Peter J. Liquid Crystals: Nature's Delicate Phase of Matter. Princeton University Press, 1991. Doane, J. W., ed. Liquid Crystal Displays and Applications. SPIE-International Society for Optical Engineering, 1990. O'Mara, William C. Liquid Crystal Flat Panel Display: Manufacturing Science and Technology. Van Nostrand Reinhold, 1993. Curran, Lawrence. "Kopin, Sarnoff Team in Advanced LCD Effort." Electronics. August 10, 1992, p. 11. Fitzgerald, Michael. "Display Standards Elusive." Computerworld. December 21, 1992, p. 27. Fleischmann, Mark. "Wall-Size TV from Tiny LCDs." Popular Science. June, 1991, p. 94. Kinnaman, Daniel E. "LCD Panels: The Next Generation." Technology & Learning. March, 1993, p. 44. Robinson, Gail M. "Display Systems Leap Forward: New Technologies Offer Designers More Choices Than Ever in CRTs, LCDs, EL and More." Design News. February 13, 1989, p. 52. Woodard, Ollie C., Sr. and Tom Long. "Display Technologies." Byte. July, 1992, p. 158.